Mnangagwa Must Act, But Don't Give Up on Zimbabwe – Former Envoy Tells U.S.
EFF leader Julius Malema and Zimbabwe President Emmerson Mnangagwa. 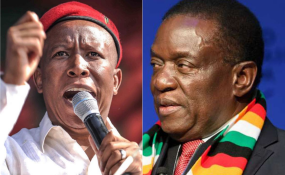 Julias Malema, leader of the outspoken South African opposition party Economic Freedom Fighter (EFF) has come out guns blazing against President Emmerson Mnangagwa's administration over the recent military crackdown on civilians that left 12 people dead and hundreds injured. Addressing a press conference before the launch of the party manifesto, Malema said Mnangagwa must know that unleashing soldiers on unarmed civilians is unacceptable and that the ruling party 76 year old leader has lost his respect. "Anyone who unleashes soldiers on innocent unarmed people, you have declared those people an enemy of the state. You are a fool. You don't deserve my respect. If I allow it to happen in Zimbabwe it will happen here in South Africa. It is unacceptable whether it is done by Mnangagwa whether it is done by Mugabe. It is unacceptable. Mnangagwa must know that. It is unacceptable to beat up people," Malema said. The former African National Congress (ANC) Youth League Secretary denounced the government's move to shutdown internet, saying it was unacceptable and barbaric. "To break cellphones of people. To shut down the internet. It is unacceptable. It is barbaric. In 2019 you have a leader who shuts down internet and shuts down social media? That is so backward," Malema fumed. Meanwhile, Malema threw a jibe at opposition MDC President Nelson Chamisa saying his movement did not agree with his ideological pathway.